Many caravan accessories will make life easier on the road and when on site, so your trip runs as smoothly as possible. And there are many accessories you simply can’t go caravanning without. Last month we asked caravanners to vote for their top three must-have accessories and once again you voted in your hundreds. With more than 500 votes we’ve been able to pull together a top five list of things you cannot go on a caravan holiday without. It was no surprise to see that the trusty motor mover took the top spot in our poll with 45% of the overall votes. Enabling you to steer your caravan into the tightest of spots, whether that’s at home, when pitching up site, or putting it back into storage, a motor mover will make light work of manoeuvring your tourer. You definitely need plenty of fresh water when caravanning and a rolling water container will make light work of carrying water to and from your caravan so all your fresh water needs are catered for. An Aquaroll will hold up to 40 litres of water – meaning less trips to top up your supply. Plus, filling up the Aquaroll is a great job to get the kids involved in setting up. It gained second place with 38% of the votes. 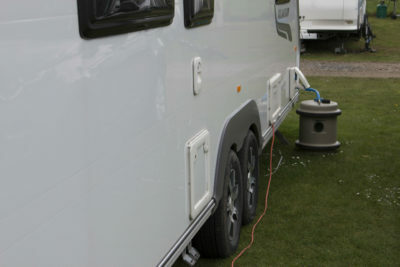 Connecting you and your tourer to a mains electric hook up point, an electric hook up cable will provide power for your appliances, just like at home. In at number three with a third of the votes, hook up cables are available in a range of sizes, but make sure it’s long enough to reach the hook up point on your pitch. Adapters are also available to use the lead when travelling in Europe. 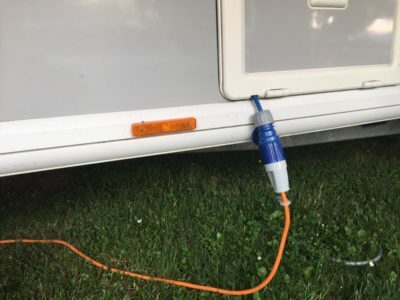 Remember to always connect the lead to your caravan first, don’t overload the power supply by using too many appliances at the same time and uncoil the cable to preventing it from overheating. A caravan awning will help to increase the living space of your tourer, once you’ve finallygot it up! They come in all manner of sizes and variants. 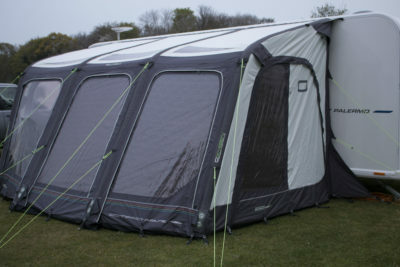 There are inflatable awnings, pole or roll out – full awnings, doubling the living area of your caravan; porch awning, perfect for taking off wet and muddy clothes and storing buckets and spades or bikes; and canopy awnings. All are the perfect place to relax, eat and take shelter. Our insurance policy provides cover if your awning is damaged by bad weather – just make sure the awning is included in your sums insured value. 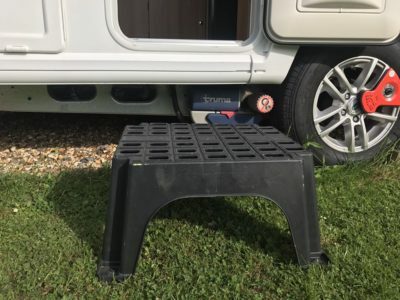 Making the top five, a caravan step is a must to make life easier when getting in and out of your caravan, particularly if you’re travelling with children or not up to leaping into your tourer! Caravanners are spoilt for choice when choosing this piece of simple equipment. There’s a single caravan step or a double caravan step, and you can even get a foldable step. They come in metal or plastic and it’s worthwhile getting one with a non-slip tread – you can even get a glow-in-the-dark tread cover! Thanks to everyone who voted and to those who added some things we missed. “A sense of humour” was one thing many of you can’t travel without and got more votes than the TV and barbecue – definitely needed when putting up the awning! The tow car obviously got a mention, as did alcohol, gas and the toilet cassette. When you’ve bought all your caravan accessories, make sure you include their value in your caravan insurance sums insured and avoid theft by not leaving leave expensive items in your caravan awning or in an unlocked caravan. Look out for our latest poll on our news blog about staying connected while touring in your caravan. Hi Tommy, Try Alpha Batteries for a Solar Panel you will get a good bargain price for DIY. my friend as just fit one himself, what a good job it looks very professional, cost a lot lot less than mine fitted at the dealers. all the best. Ken. We used to have a small foldable solar panel. This was ok for weekends if we were careful with the battery. We have two kids charging tablets phones etc plus occasional tv. I’ve changed all the halogen bulbs to led. Portable panels are easily pinched. As the van is under warranty we got the dealer to fit a 100w panel on the roof. As the cable needed a hole drilling through the roof I thought it best left to the experts. Were so happy with this setup that we’re doing two weeks in wales without hookup. Been seriously considering a solar panel for my van, we go to a couple of festivals a year where there is no hookup, been using a generator, any tips on a decent solar panel. Interesting comments. Having an Eriba, I cannot justify a mover. Watching campers erect Awnings and the time taken to get it right, totally puts me off. It seems to me that it is a way of avoiding the more mundane chores. Thought the survey was interesting. I have to put my caravan on the drive forwards so wouldn’t be able to do this without the movers. Was a little disappointed that the hook up cable was so high up in the results. My family and I go on rallies where no hook-up is available we enjoy these and never use electric just a decent solar panel. You’d be surprised what you can do without that orange cable. 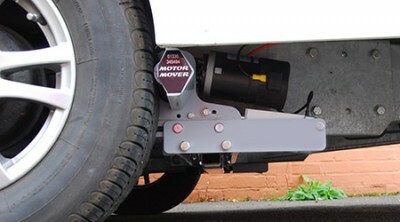 Got to be the motor mover, I resisted it for years what do I want a mover for always made my Landrover do the work no problem, now at the age of 75 had one fitted last year should have done it sooner makes life much easier , after speaking to Powrtouch about motor movers and which one to choose, reply was do you want to keep caravanning for a few more years? yes, then I would recommend our auto unit, had it fitted by them what a service, it is fantastic. I am 76 yrs of age, and divorced, (Recently) but the only thing stopping me carravaning, and selling my outfit, was that I have a motor mover, which means I can still go away, without the worries of “Parking” my van on site. We resisted a motor mover for several years, but would agree the most important thing, particularly as you get a little older , is the mover. It has made our lives so much easier and the speed with which it now allows us to pitch is amazing. I simply would not go back to life without one. my reversing skills with a trailer or caravan are very good but without my motor mover there are some sites I’ve been to that would test the best, touring site at Haggerston Castle on the borders comes to mind, 9 out of 10 times I don’t really need it but when you get to that one, thank goodness for the mover, and man handling is not an option since major surgery 2 years ago, caravan holidays are meant for relaxing, not popping a blood vessel, my vote for movers is a big fat Yes. It all depends on where your caravan is mine in my Garden once I have it in there I use the motor mover, it would be impractical to use my car, I also hold an LGV one so reverseing not a problem to me. Could not have caravan without motor mover. Best thing ever. A motor mover is not just for reversing onto a pitch. Where we live is on a tight bend onto a steep driveway. My caravan is 8.0M long and my tow vehicle is 5.5M long making manoeuvring very difficult on or off our driveway. Our motor mover solves this problem, which incidentally, is what it is designed for. P.S. I have also completed the Caravan Club reversing course and I feel I am an accomplished hand at reversing. A motor mover is Not as important if you know how to reverse! .These are far more important. We sometimes use an awning but it is not that important though still more use than a motor mover.